filed: June 26, 2012 • Blogs, U.S. Recently the “Political Economy Research Institute” at the University of Massachusetts released a graphic purporting to show “green” technologies create more jobs than traditional energy sources. The graphic, to the right, has been distributed widely by advocates of creating “green jobs.” This is a common assertion from the environmental left. As I note in my book Eco-Fads, this claim is made by many on the left. One Seattle Times columnist wrote approvingly of a study that found spending on ‘green’ projects “produced more ‘job hours’ than tax cuts or traditional infrastructure spending.” This, they claim, is a good thing. The left, however, is halfhearted in its application of this approach. If they really want to create more jobs we can do much better. For example, the graph shows 14 jobs are created per $1 million invested in solar energy, twice the amount created from coal. But we can do better. We can generate 500,000 kilowatt hours (kWh) of perfectly clean energy (enough to power 80 houses for an entire year!) while creating hundreds of jobs. I’ve modified the original graphic, which ended with the “Mass Transit/Freight Rail” row to include the best option of all – generating electricity using bicycle generators. 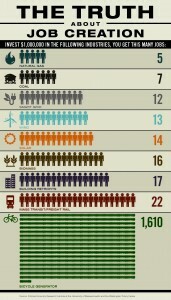 Pedaling ten hours a day on a stationary bike, each person can generate 1 kWh. Investing $1 million in bicycle generators and paying people the going rate for the energy they create, we could create 1,610 jobs. The reason solar power creates more jobs per $1 million is that solar is extremely inefficient, requiring more workers to do more as they produce less. We could easily apply this to other sectors. If we want to create more farm jobs (after all the percentage of farm jobs in the economy has fallen dramatically in the last century), we could ban tractors. Think of all the jobs we’d create for farm workers! You may think that environmentalism and concern about resources means doing more with less. According to the Political Economy Research Institute and the environmental left, you would be wrong. They believe the way to create jobs and help the environment is by doing less with more – substituting high-cost solar power for low-cost natural gas. Using more resources (human and otherwise) and returning less energy. And there are real-world examples of the “success” of this strategy. In 2008, Spain was widely lauded for its efforts to create a new, green economy. Today their unemployment rate is 25 percent. The Pew Research Center ranks Oregon as the top state for “green jobs” in the country. Their unemployment rate has been above the national average every month for the last four years. Number three on the list is California, with a current unemployment rate of 10.9 percent. Last on the list? Natural gas rich North Dakota, with a current unemployment rate of 3 percent.